This article describes how to manage general settings for Zendesk Talk numbers. For details about managing number-specific settings, see Managing individual number settings. For details about adding new numbers, see Adding Zendesk Talk numbers. You can delete an existing number if you don't want to use it anymore. Next to the number you want edit settings for, click the menu icon, then select Delete. Your Zendesk Talk number is removed from your account when your trial expires, your Zendesk Talk subscription is canceled, or your account is suspended or deleted. Within 72 hours, you can contact our customer service team to reinstate your Talk number if you have resolved the issue with your account. Contact our customer service team (support@zendesk.com). In the event that Zendesk Support is unavailable, the failover feature will route all incoming calls to a pre-designated number so you can help your customers with minimal disruption. Calls are sent to your failover number when Zendesk detects that your Talk number is unresponsive because Zendesk Support is completely down. It is an automated process. When the outage is resolved, calls automatically revert back to your Talk number. You can view if your Zendesk Support is experiencing an issue on the Zendesk status page. For customers on the Talk Enterprise plan, if Zendesk Support is available to your end-users but you are unable to access it (you’re experiencing a localized internet outage, for instance), you can request to have failover manually initiated by calling Zendesk Support. Zendesk will manually initiate failover for you once a month. Important: Failover can be enabled for a maximum of 24 Hours. After 24 hours, we must disable it. Must be a non-Zendesk Talk number. Must be able to handle your support call volume, as all incoming calls are routed to it. Is not restricted based on the location of your Talk number. Works only for incoming calls; outgoing calls do not have the ability to use the failover number. Next to the number you want to add a failover number for, click the menu icon, then select Edit. Enter the number in the Failover number field on the Settings tab. Note: Failover numbers must be entered in e.164 format. For more information, see What are the accepted phone number formats for Talk? in our Support tech notes. 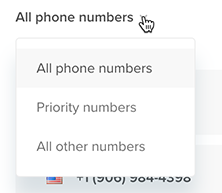 You can set certain phone numbers to be priority numbers, meaning calls received at these numbers will be sent to the front of the queue of available agents. For example, you might want to prioritize calls from actively subscribed customers over calls from trial users. Note: The priority numbers feature is only available for Talk Professional and Enterprise. The list of phone numbers is sorted into Priority numbers and All other numbers. You can also filter this list to show only priority numbers or other numbers. Click the drop-down list next to All phone numbers at the top of the list. Select Priority numbers or All other numbers to filter the list accordingly. Hover over the number you want to edit and select the check box that appears. Click Set number priority at the top of the list of numbers. Select either Set as priority number or Remove priority, depending on the change you're making. The list of numbers automatically refreshes with your changes. On my account (phone # 925-421-2455) I do not have the option of adding a failover number. Is this due to my Zendesk Plan needing to be upgraded? I want to connect Hungarian free toll number (I have it already) to my agent in Zendesk. Can you aid me? I was wondering if there are any details that could be shared on what form the ticket will take - like tags, specific identifiers, etc. This would help us manage them so that they don't overload our queue, and to put some automations in place to get the most out of the new feature. For the following point, I had to find out in another thread that this is only for Talk Advanced. 5. If you want to set a wrap-up time limit, select an option from the drop-down menu next to Wrap-up time limit. Would have saved me a few minutes of wondering if my set-up was glitchy I think if it was mentioned this isn't available on other plans. Is it possible to set an agent to automatically go back online after a call? Or do thy have to click available? I am having trouble deleting a number from my text channel. I have followed the instructions but no delete option is available in the Channel>Text>Numbers section. How many numbers can be added to Talk? we are a 4 fascia business and need to possibly have 4 options now. Are you able to set priority for Zendesk Tickets that come in through other channels (through phone number in app, or emails)? You should be able to set up a trigger that will set priority for you based on the ticket channel. You can find out more about triggers in this article. I am Tan from Vietnam. I want to know if Zendesk supports the contact number from Vietnam. Its mean can customers contact the agent through Zendesk from a Vietnam mobile phone and can the support number of zendesk be a phone from Vietnam, can't it? we just enabled Talk in our instance and did some test outbound calls - it turns out that in each case, the calling number was different. Can we somehow define which number will be displayed to the clients? We have a Vietnam beta for numbers here, https://docs.google.com/forms/d/e/1FAIpQLSc_8tuSCGEHYrWFq3gaNPl-px7udOkXCszj2QDECknKw7bstA/viewform, if you would like to add your account to the beta for testing. When you place a call from the browser UI, the agent needs to select a number for connecting the call. If you are seeing that different numbers are being referenced by the caller ids, I would suggest sending in a ticket to support@zendesk.com so that our agents can get more account specific information from you to see what behavior is occurring and why. Otherwise, you would not have any additional control showing specific numbers beyond the support numbers connected to Zendesk Talk. We want to change our subscription from Lite to Talk in the Suite, can we change the number assigned to us to reflect an AU number? Please send me the details on how to thru dette@paystaff.com.au. You can find more information in our Adding Zendesk Talk numbers documentation which I've linked for you. It was recommended by the support member that by forwarding calls from Talk to our local number we should be able to use Talk services. By doing call forwarding – Are we going to be able to call and receive calls/SMS using our local number through Zendesk dashboard? Is the above approach going to have tickets created for both inbound and outbounds communications? You would need to work with your phone provider and have them forward any calls from your Tanzania number to your Talk number you created. This will allow for you to answer calls directly from within the Support agent interface and tickets will be generated as well. As for making outbound calls, I believe you can set up your number as an external number to make outbound calls from. See Adding Zendesk Talk numbers for more information. If that doesn't work then you'd need to make an outbound call form the supported Talk number you added to your account. As for SMS, you'd need to do so from the Talk number added to your account since Tanzania is not a country that Zendesk provides numbers for.